Did the waiter in Rome sneer when you asked for butter for the bread or for a cappuccino after dinner? Did your Venetian grandmother slap your hand when you reached for the Parmesan cheese to sprinkle on her spaghetti alle vongole? Did the Florentine guest in your home turn pale when offered leftover pizza for breakfast? Did the fruit and vegetable vendor at the Mercato Centrale yell at you when you checked out the ripeness of his peaches or scooped up a handful of cherries? In Italy, they love making rules, although they seem to obey very few. When it comes to the national cuisine, however, the Italian Food Rules may as well be carved in marble. They will not change and are strictly followed. Visitors to Italy violate them at their peril. When in Italy, enjoy being Italian for a few days, weeks or months, by learning the Italian Food Rules, taking them to heart, and obeying each and every one of them. The new book from Ann Reavis is now available in paperback and Kindle format from Amazon.com and paperback from Amazon.co.uk. In Italy they love making rules … and they obey very few … except when it comes to food. The Italian Food Rules may as well be carved in marble. They will not change and you violate them at your peril. I grew up during the ’50’s in the American West where there were no food rules. TV dinners vied with Chef Boyardee canned spaghetti and meatballs. Sweet potatoes were topped with marshmallows. A fried egg smothered in ketchup or a breakfast burrito was equally good in the morning. Iced tea paired well with any food. A Filet O’Fish, French fries, and a Big Gulp were road food – better tasting eaten in the car, than out. 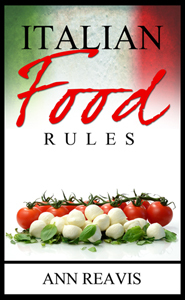 Click to continue reading sample chapters of Italian Food Rules. Click to read how Italian Food Rules came to be. Read more from Ann on her blog Tuscan Traveler. Subscribe to the Italian Food Rules Newsletter.